I love skirts that move when I walk. Swing skirts, A-line skirts and maxi skirts. In the 90s I had a floor length A-line black satin skirt that I got so much wear out of. I wish I had it now. I have moved houses, cities and countries so often over the years that I sadly haven’t been able to hang on to many things. The great news is that Atlanta label Jibri has a collection of swishy skirts in its online store, and except maybe for the leather look one and the tie-dye, I want them all. Any one of them would make a beautiful anchor to a 2017 wardrobe. I’ll go further and suggest that these skirts are modern classics, and could become wardrobe staples that you’ll love for years. 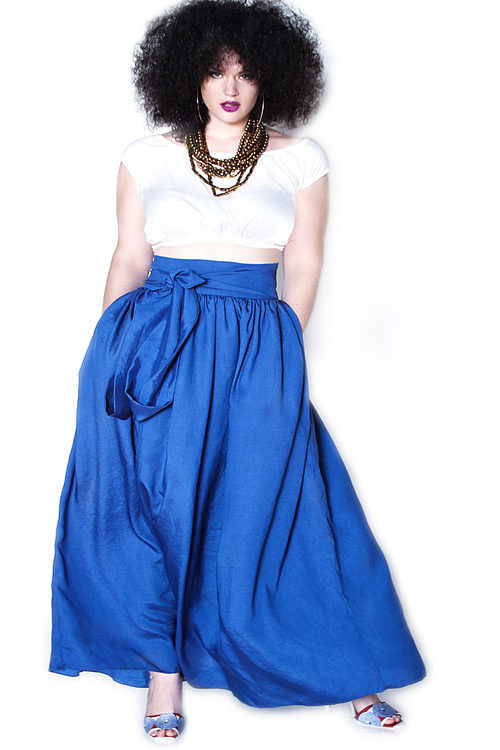 Here is the high waisted belted maxi skirt in royal blue. It comes in 8 colours and is made from a silk blend. US$130. There is so much you could do with this skirt. Wear it to a ball, pair it with a tank top for casual time, wear it for work. Here’s the high waist swing shirt in tan microsuede with a mini dot pattern. US$140. You can choose two different lengths. To be clear, I have no affiliation, including any commercial relationship or contact with the operators of Jibri. I do subscribe to their public newsletter though. It was actually an email they sent me back in October 2016 that I only just looked at today, which prompted me to visit the store and discover these fabulous skirts! Do you own one of the Jibri skirts?Tell us about it in the comments below.